I would like to do some reflections on a very interesting topic related to the fundamentals of the most powerful predictive technique: the directions. Regrettably, what we are going to say here is not mentioned in general and naturally we are then faced with the question of why and the raison d’etre of everything. We are going to deal with this issue following the guidelines of Jean Hiéroz and some necessary amplifications. 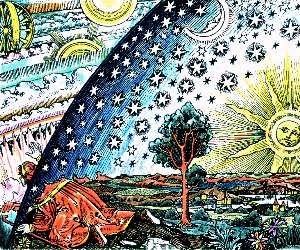 As we all know the very foundation of Astrology is the Law of Correspondence and Analogy, based on the traditional hermetic aphorism of the Emerald Table which is worth quoting in detail: “It is true and not a lie, certain and deeply real that that which is up is like that which is down and that which is down is like that which is up with the idea of perpetuating the miracle of unity”. Starting on this premise we can establish the analogical correspondence between a rotation of the Earth round its axis (one day) and a rotation of the Sun (in its apparent movement) round the Earth (that is one year). These are the keys to the secondary directions, which are, according to Guido Bonatis in his Astrosophia Naturalis, well known since times remote. He became famous in his days because of the accuracy of his predictions using this key. But sadly, in the emphasis on simplification, the proceedings were ruined. It has very little efficacy in the way it is used today (the average in the predictability of the directions is one in twenty). As those who teach deal with anything but the experimental method, they keep practising and insisting on something which is of very little value in its present form. But let us continue with this topic. One day corresponds to one rotation of the Earth and this corresponds to one rotation of the Sun (one year). But as the Sun travels one grade in one day it results, extending the correspondence, that one grade corresponds to one year. This is Ptolemy’s famous key, the first of the keys used not only in the symbolic directions but in the mundane directions as well, and certainly, absolutely efficient and useful. Let us go on with the analogical reasoning. If we analyse the apparent movement of the Sun round the Earth during one year, the sun will travel along twelve signs of 30° each one in this lapse. If we reverse the equation and the lapse of twelve years corresponds to a sign (30°), each one will be 2° 30’. This is the famous dwadashamsa key (very famous among the hindues), and, what is more important, it is another key absolutely efficient in the symbolic directions. On these two keys I built up all my theory of the Multiple Keys which has given and keeps giving wonderful results in the practice of Astrology not only individual but mundane as well (political). But we still have something to say. Which is the origin of Naibod Key, so useful in primary directions under the pole of the significator? It is very simple, in one year the Sun will complete a rotation of 360° around the Earth in its apparent movement. But this year has a duration of 365, 242198 days, being this value only approximate, taking into account average solar days as well as ephemeris days (in this respect we can consult a good text of Position Astronomy, for example that of Teodoro Vives). Working on the quotient and expressing it in grades it is 360 / 365, 242198 = 0,9856 = 0° 59’ 08,33” which corresponds to the average movement of the Sun in one day of the ephemeris. This last variable is Naibod Key.